New York Rangers goalie Henrik Lundqvist will almost certainly be taking home the Vezina Trophy this season as the league’s top goaltender. He’s no. 1 in save percentage (.938) and shutouts (eight), and is second in goals-against average (1.82). With the Rangers contending for the overall best regular-season record, he’ll also probably be getting more than a few votes for the Hart Memorial Trophy as the NHL’s most valuable player. Still, even Lundqvist has managed to drive his coaches a little bit crazy. “Oh, they hate it, they hate it,” the goalie chuckled Sunday afternoon when I asked him about one particular save he made during the Rangers’ 4-3 win over Boston. Lundqvist’s third-period stop on a rising Benoit Pouliot snap shot wasn’t a kick save, or a glove save, or a desperation snow-angel-like move, but rather a header — an intentional redirection off his crown. He’s been having a particularly heady season. In an October 27 game against the Toronto Maple Leafs, he treated a Carl Gunnarsson shot as if the puck were a hacky sack and not a dense rubber disc. A few weeks later, in a November 15 contest against the New York Islanders, he began an impossible sequence in much the same way. That’s what Elliotte Friedman was worried about when he wrote in a column last month: “It’s funny when Henrik Lundqvist intentionally makes a save off his head. 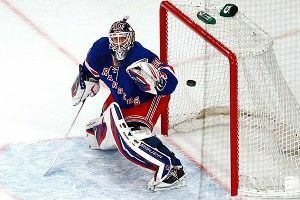 But, if I worked for the Rangers and thought of Mike Richter, I’d cringe every time.” In 2002, Richter “both leaped and turned his head to the left before getting hit” by a high slap shot. The result was a fractured skull just above his ear, another setback in an attempt to recover from concussions; Richter would retire the following year. Friedman’s column linked to a Rangers-Capitals game on February 12 in which the the puck ricocheted high off the top of Lundqvist’s sparkly helmet and back up and over the boards. You could tell he had hit the sweet spot head-on. “Well, they play a lot of soccer in Sweden,” NBC’s Pierre McGuire surmised. On Sunday, I asked Lundqvist if he had participated in the sport.